Lipomas are benign mesenchymal tumors that originate in mature fat cells, usually surrounded by a thin fibrous capsule. They are the most common soft tissue tumor with 20% cases occurring in head and neck region. In order to prevent reoccurrence, adequate surgical excision is the treatment of choice. This paper reports a case of lipoma of the buccal mucosa, along with a discussion and review of the literature. A 60 year old male came to the Department of Oral Medicine and Radiology, Ahmedabad Dental College and Hospital, Ahmedabad with the chief complaint of a growth in the lower left cheek region since 6 months. There was no history of trauma or fever, with no relevant past medical or dental, family or social history. The growth did not interfere with mastication, or any other function generally performed by the orofacial apparatus. On general examination, the patient was of normal built and height with no obvious facial asymmetry extra-orally. His left submandibular lymph nodes were firm, palpable and non-tender. 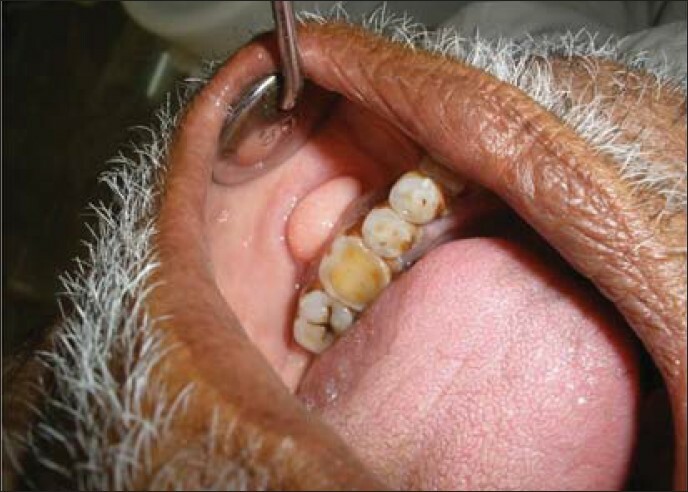 The intra-oral examination revealed a single, well defined, pedunculated growth in left buccal mucosal region extending from mesial aspect of 35 to distal aspect of 36, with smooth, faint yellow colored surface. The growth was oval, soft in consistency and non-tender measuring 2cm × 2cm in size [Figure 1] and [Figure 2]. 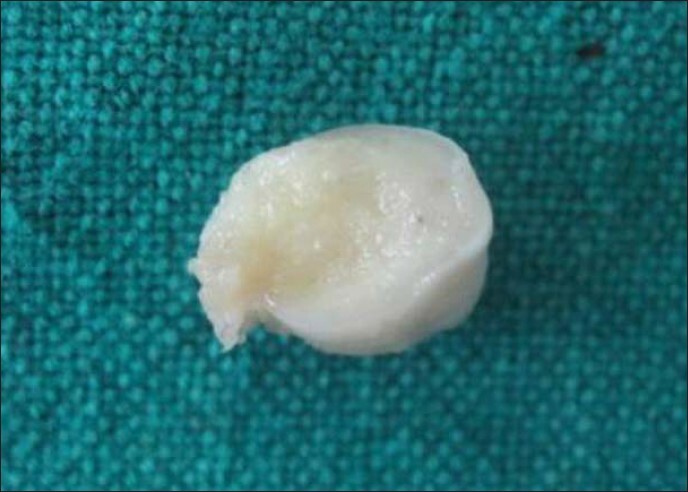 On the basis of the history and clinical examination, a provisional diagnosis of Intra-oral lipoma was made with fibroma and pyogenic granuloma as differential diagnoses. 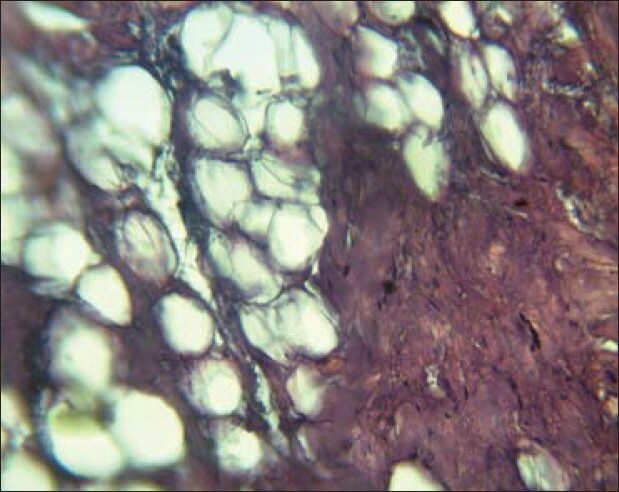 Haematoxylin and Eosin stained section shows a thin, fibrous capsule around a lobular arrangement of mature adipocytes admixed with collagenic streaks. The adipocytes are identical to normal fat cells. Dilated capillaries with RBCs and chronic inflammatory cells are also seen. The whole lesion is surrounded by atrophic, parakeratinized stratified squamous epithelium. 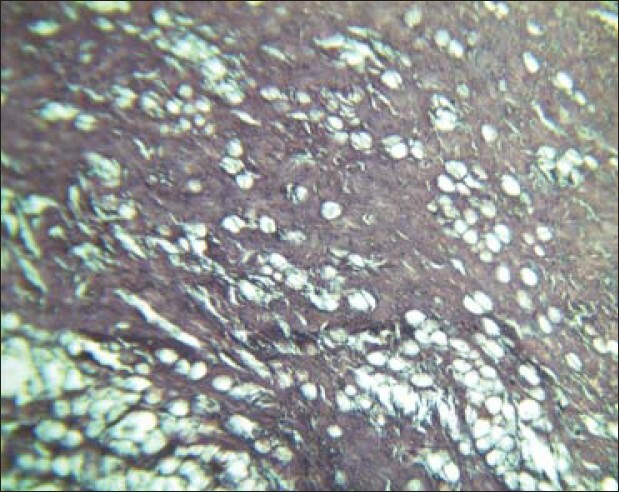 A final diagnosis of an in Fibrolipoma was, therefore considered, histopathologically [Figure 3] and [Figure 4]. 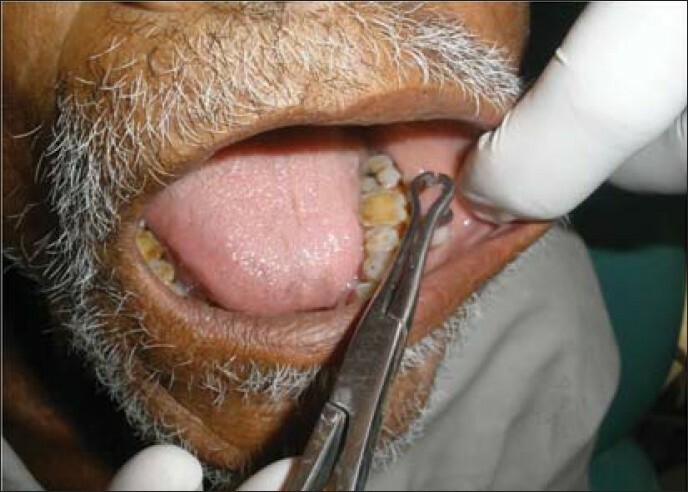 Surgical excision is the treatment of choice for oral lipomas and therefore the lesion was approached intra-orally and no post-operative complications resulted [Figure 5]. Roux in 1848, for the first time described the oral lipoma and he referred it to as 'yellow epulis'. Lipomas are benign mesenchymal tumors that originate in mature fat cells, with a rare incidence of 1% to 4% occurrence in oral cavity. The peak incidence age for lipoma is 40 years , and above, while in our case, the patient was 60 years of age. Fibrolipoma: most common microscopic variant of oral lipoma, characterized by a significant fibrous component intermixed with lobules of fat cells. Angiolipoma: a mixture of fat cells and numerous small blood vessels. Spindle cell lipoma: variable amounts of uniform appearing spindle cells, typically in conjugation with a lipomatous compound. Pleomorphic lipoma: presence of spindle cells with bizarre hyperchromatic giant cells. Intramuscular/Infiltrating lipoma: more deeply situated and having an infiltrative growth pattern extending between skeletal and smooth muscle bundle. Our case presented histopathologic features of Fibrolipoma. Some other lesions should be considered in differential diagnoses, and these include oral lymphoepithelial cysts, epidermoid and oral dermoid cysts. Microscopically, it is difficult to differentiate between normal adipose tissue and lipoma, therefore a clinician sending a surgical specimen to the pathologist for microscopic analysis must provide accurate clinical and surgical information in order to make a definitive diagnosis. As with all fatty tissue, a lipoma will float on the surface of formalin rather than sink to the bottom of a biopsy specimen jar. Microscopic appearance of a circumscribed but not encapsulated aggregate, with large clear cytoplasm, in the absence of vascularity, atypia of metaplasia is diagnostic of a classical lipoma. Adequate surgical excision is the treatment for oral lipoma. The approach being dependent on the site of tumor and proposed cosmetic result, our patient's lipoma was approached intra-oral and no postoperative complication resulted. Buccal soft tissue lipomas are rare tumors. Other lesions with similar clinical features can be considered in differential diagnosis, so high index of suspicion is required in making a diagnosis. Features of lipoma are usually straightforward and classical. Surgical excision is the ideal treatment with excellent outcome. 1. Fregnani ER, Pires FR, Falzani R, Copes MA, Vorgas PA. Lipomas of the oral cavity: Clinical findings, histological classification and proliferation activity of 46 cases. Int J Oral Max Surg 2003;32:49-53. 2. De Visscher JG. Lipomas and Fibrolipoma of the oral cavity. J Oral Maxillofac Surg 1982;13:177-81. 3. Gnepp DR, Editor. Diagnostic surgical pathology of head and neck. Philadelphia: WB Saunders; 2001. 4. Weiss SW, Goldblum JR, Editors. Benign lipomatous tumors. In: Enzinger and weiss's, soft tissue tumors. 4 th ed, St. Louis: Mosby; 2001. p. 571-639. 5. Wood NG, Goaz PW. Differential diagnosis of oral and maxillofacial regions. 5 th ed, St. Louis Mosby; 1977. 6. Epivatianou A, Markopoulous AK, Papayanatou P. Tumours of adipose tissue of oral cavity: A clinic pathological study of 13 cases. J Oral Maxillofac Surg 2000;58:1113-8. 7. Rajendra R, Sivapathasundharam. B. Shafer's. Textbook of oral pathology. 6 th ed. India: Elsevier; 2009. 8. Furlong MA, Fanburg-Smith JC, children EL. Lipoma of the oral and maxillofacial region: Site and sub-classification of 125 cases. Oral Surg Oral Med Oral Pathol Oral Radiol Endod 2004;98:441-50. 9. Studart-Soares EC, Costa FW, Sousa FB, Alves AP, Osterne RL. Oral lipomas in a Brazilian population 10 year study analysis of 450 cases reported in the literature. Med Oral Pathol Oral Cir Buccal 2010:15:691-6. 10. Woodhouse JB, Delahunt B, English SF, Fraser HH, Fergusan MM. Testicular lipomatosis in Cowden's syndrome. Mod Pathol 2005;18:1151-6. 11. Bandeca MC, de Padua JM, Nadalin MR, Ozorio JE Silva-Sousa T, da Cruz Perez DE. Oral soft tissue lipomas: A case series. J Can Dent Assoc 2007;73:431-4.